1) AMY AND ISABELLE by Elizabeth Strout. This was Strout’s first novel and boy, was it an amazing beginning to what’s gone on to be a sterling career (OLIVE KITTEREDGE, THE BURGESS BOYS, ABIDE WITH ME). In AMY AND ISABELLE, a mother’s shocked to learn her teenage daughter is having a sexual relationship with a teacher at her school. Strout sets the book in a small town where other issues like crop failures and UFO’s add to the confusion. The closeness yet distance of mother-daughter relationships comes across especially strongly. 2) UNLESS, by Carol Shields. In this, the wonderful Canadian writer, Carol Shield’s last book, we are told the story of Reta, whose college-aged daughter has dropped out of school and sits on a busy corner in downtown Toronto with a sign on her chest reading, “Goodness.” How Reta comes to grips with her daughter’s choice and what she learns about the role of women in literature are the crux of the book. Every book Shields wrote is a marvel. 3) TERMS OF ENDEARMENT by Larry McMurty. Most of us probably know this book from the Shirley Maclaine, Debra Winger film, but it was a novel first and a darn good one. Aurora, the mother, is smothering and critical. She must always be the center of attention and a long string of beaus line up at her door. To escape her, the daughter makes a hasty marriage. And then…you know. This is the story of how she finds her own legs to stand on and how Aurora learns to be the mother her daughter needs. 4. JEWEL by Brett Lott. This is very different from the other books listed here. The daughter in JEWEL is a child born with Down’s Syndrome. Jewel already has five children when Brenda comes along. Set 80 years ago, there was little hope for kids with this disease then. Jewel finds a way to make Brenda’s life meaningful at a time when the advice was to institutionalize such children. 5. 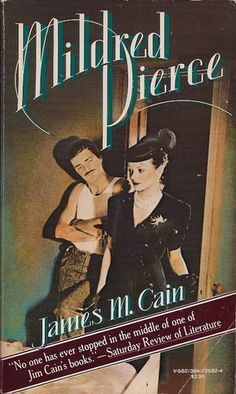 MILDRED PIERCE by James Cain. None of the four books above influenced me, at least consciously, when writing CONCRETE ANGEL. But MILDRED PIERCE did. I wanted to show the flip side of the mother-daughter coin by writing a story where the daughter makes all the sacrifices for an ungrateful mother. This is what happens to Mildred. The more she loves her daughter, the worse her daughter seems to behave. A heart-breaking story–as are all the five listed. Runner’s up-WHITE OLEANDER (Janet Fitch), ANYWHERE BUT HERE (Mona Simpson), PEARL (Mary Gordon), MOMMY DEAREST (Christine Crawford). Oddly, although I searched my memory and online, very few crime fiction stories seem to deal with mother and daughters. Do you know of any? In addition to being the Crimespree Senior Film Critic, Patricia is the author of more than 100 stories in print, online, and in various anthologies. In 2009, she won a Derringer Award for her story MY HERO. She is the author of two ebooks of stories: MONKEY JUSTICE and HOME INVASION (through Snubnose Press). She is the co-editor of DISCOUNT NOIR (Unteed Reads) and her debut novel, CONCRETE ANGEL, is in stores now. She hosts a look at Forgotten Books every Friday with readers, writers and reviewers at pattinase.blogspot.com. She makes her home in Detroit.